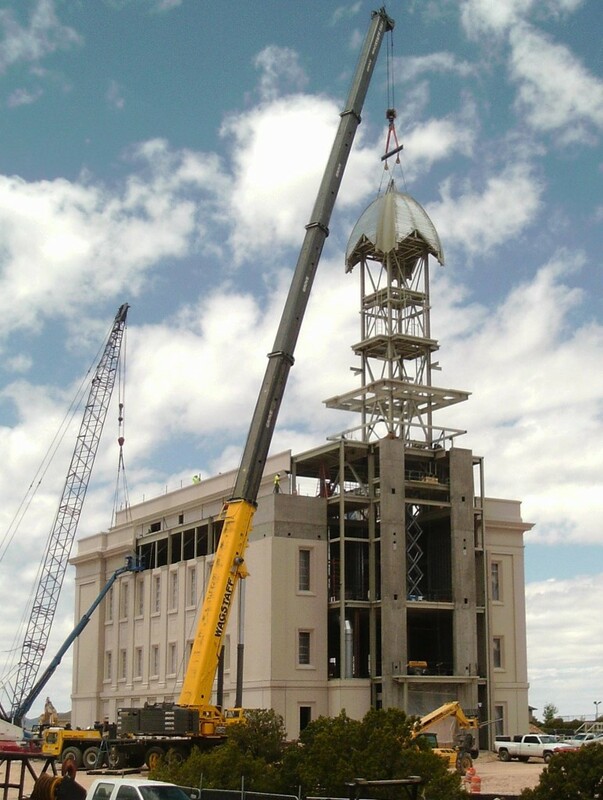 CEDAR CITY – Residents buzzed with excitement on the grounds of the Cedar City temple of The Church of Jesus Christ of Latter-day Saints Tuesday as they gathered to watch the next step in construction – the placing of the steeple on top of the building. Leaders of the church had not previously announced the event out of concern for the droves of people it would bring out. But like so much in a small town, word gets around; and by 11 a.m. many community members were either already at the temple or headed over. The scene resembled one outside a sporting event as cars lined the curbs and bumper-to-bumper traffic jammed the streets with drivers in search of a parking spot. On the temple grounds, located at 300 S. Cove Drive, there were more than 200 spectators waiting in anticipation of the event. 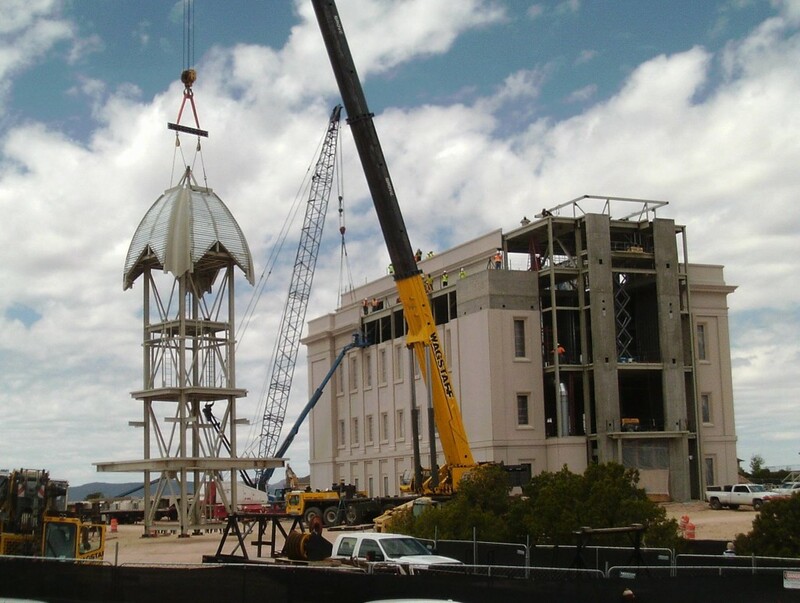 The steeple rising above the spectators symbolized the progress that has already been made in less than a year, Cedar City Mayor Maile Wilson said. Now instead of just a building frame, residents can see the temple from miles around and know what it is, Cox said. 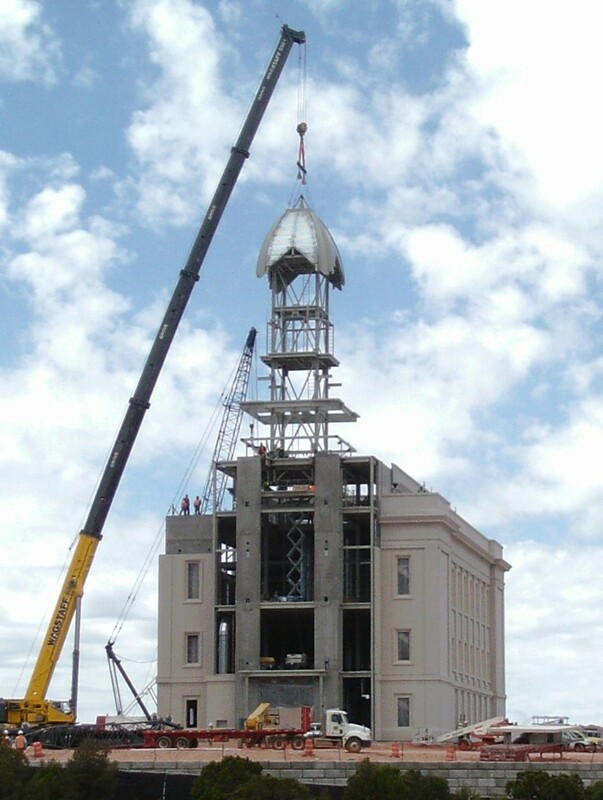 Wilson and Cox both said the next exciting phase of construction will come in the following months when the statue of the Angel Moroni is put on top of the steeple. “The Angel Moroni tops it off. The steeple is like the whip cream on top of an ice cream sundae and the Angel Moroni is the cherry,” Cox said. 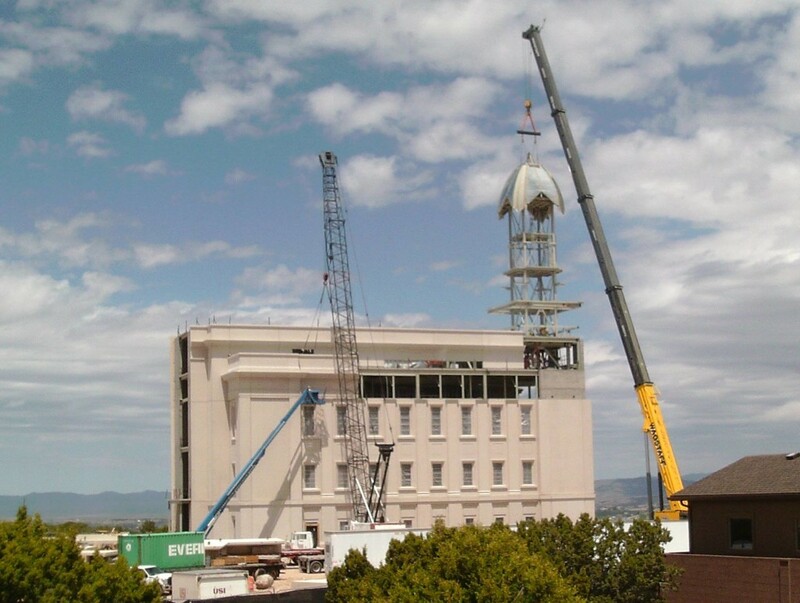 Like the steeple, church leaders may not announce a date for the Angel Moroni’s arrival, but sources say it could possibly be near the end of the summer in August. The temple property was dedicated almost a year ago. More than 1,400 people were invited to that event, many of them from the 17 stakes (congregations of Church members) living within the Cedar City area. Devout members of the Church in good standing attend LDS temples to participate in sacred ordinances such as marriage and the “sealing” of families for eternity, in addition to performing baptism by proxy for deceased persons. Those as young as 12 years old are allowed to participate in a limited way by doing vicarious baptisms for the dead. Latter-day Saints view temples as literal houses of the Lord. They are considered holy places of worship where members make covenants with God. 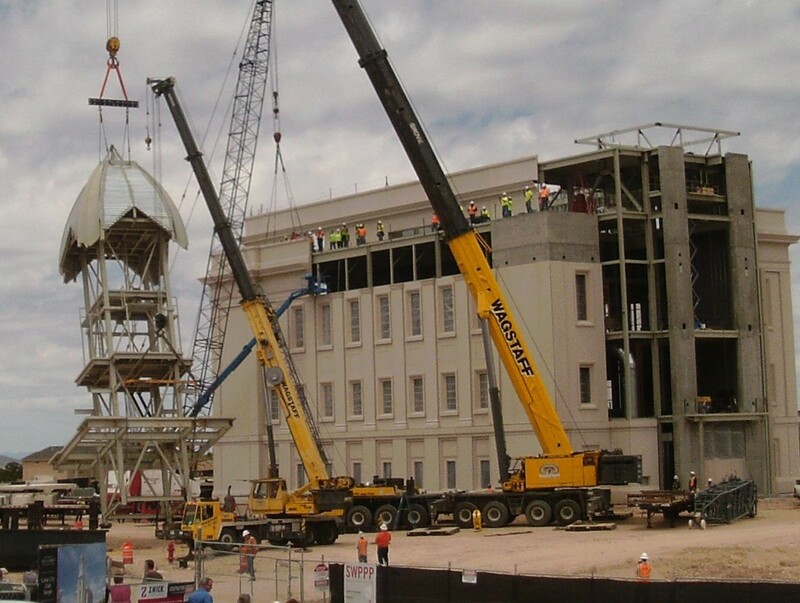 There are 177 LDS temples located around the world with 146 in operation and another 31 either under renovation, announced to be built, or under construction such as the one in Cedar City. 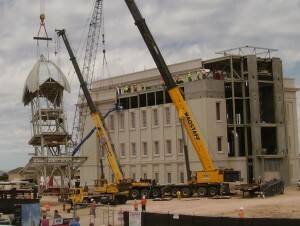 The Cedar City temple will be the 17th LDS temple built in Utah and was announced during the church’s general conference in April 2013. Please ! This is not news. I am aware that this site receives money from folks to post fake news stories, usually to sell crap to the public. Hopefully, the Mormons are paying for this story as well. The local Mormons could just as easily read about this in their local ward newsletter. Geese us. We have to see “news” about the announcement at General conference,” news” about the location, “news” about the groundbreaking, “news about each step of construction, it goes on and on. Give it a rest. The Mormons can give their members all the “news” at the warehouse and for those who care, they can contact the Mormon public relations office. Signs around the neighborhood announce missionary homecomings, carwashes for the Mormon youth, and relief society get-togethers. If St. George news chooses to embrace fake news from the mormons, please charge for it, and place a disclaimer that it is a paid public announcement. Until that happens, I will dread hearing about Moroni on the steeple, the open house, and the dedication. It is impossible to avoid mormon news. would you like fries and a shake with your McTemple? @ fun bag, People in pioneer days built temples and other church buildings with the methods, materials, and resources that were available to them. Today, much has changed in terms of architectural and building technology. You got a problem with that? 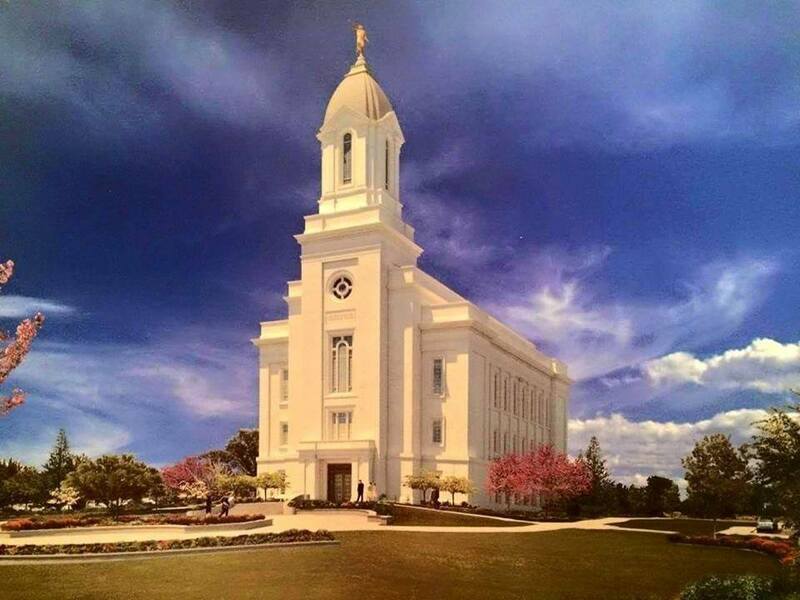 If Mormons built temples the way they did back in the mid-19th Century, you would probably accuse them of being “retro” or backwards. Meanwhile, if I want “cheesy and scammy,” I’ll go back to the Unitarian church.